Brazilian poet and attorney; born in Rio de Janeiro 1656; died at Lisbon Jan. 9, 1736. 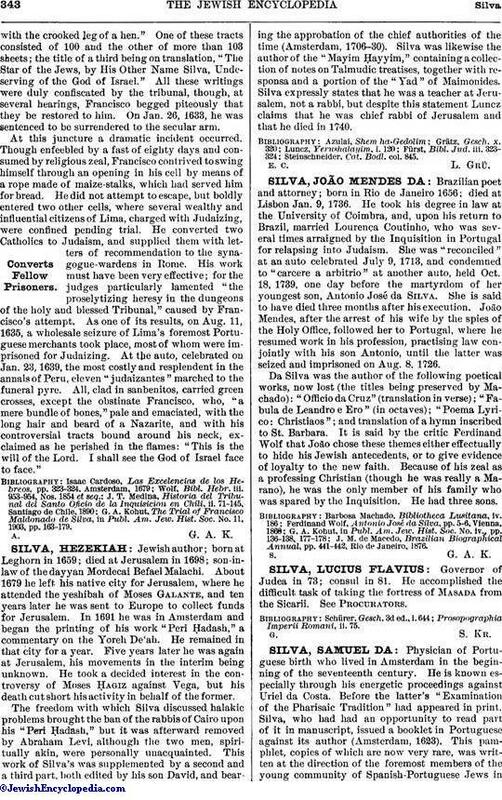 He took his degree in law at the University of Coimbra, and, upon his return to Brazil, married Lourenca Coutinho, who was several times arraigned by the Inquisition in Portugal for relapsing into Judaism. She was "reconciled" at an auto celebrated July 9, 1713, and condemned to "carcere a arbitrio" at another auto, held Oct. 18, 1739, one day before the martyrdom of her youngest son, Antonio José da Silva. She is said to have died three months after his execution. João Mendes, after the arrest of his wife by the spies of the Holy Office, followed her to Portugal, where he resumed work in his profession, practising law conjointly with his son Antonio, until the latter was seized and imprisoned on Aug. 8, 1726. Da Silva was the author of the following poetical works, now lost (the titles being preserved by Machado): "Officio da Cruz" (translation in verse); "Fabula de Leandro e Ero" (in octaves); "Poema Lyrico: Christiaos"; and translation of a hymn inscribed to St. Barbara. It is said by the critic Ferdinand Wolf that João chose these themes either effectually to hide his Jewish antecedents, or to give evidence of loyalty to the new faith. Because of his zeal as a professing Christian (though he was really a Marano), he was the only member of his family who was spared by the Inquisition. He had three sons. J. M. de Macedo, Brazilian Biographical Annual, pp. 441-442, Rio de Janeiro, 1876.